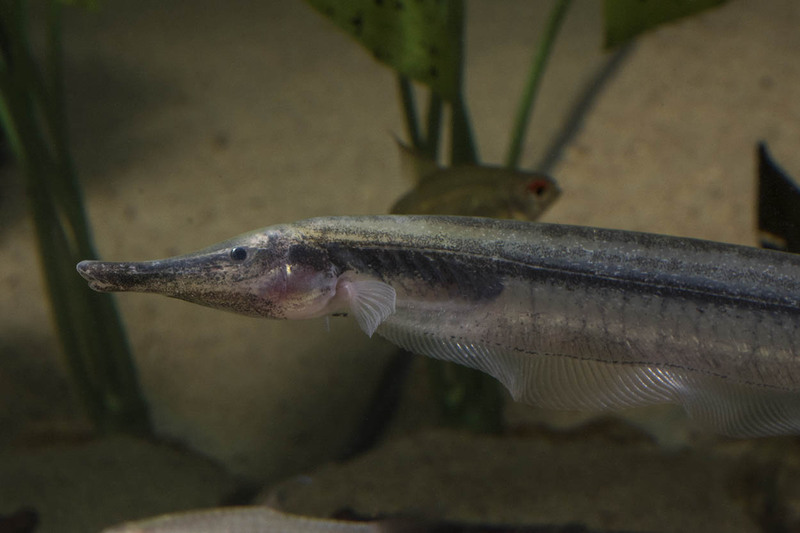 The undeniably odd Thermometer Knifefish (Gymnorhamphichthys rondoni) is found throughout the Amazon basin but is rarely seen in the aquarium hobby. 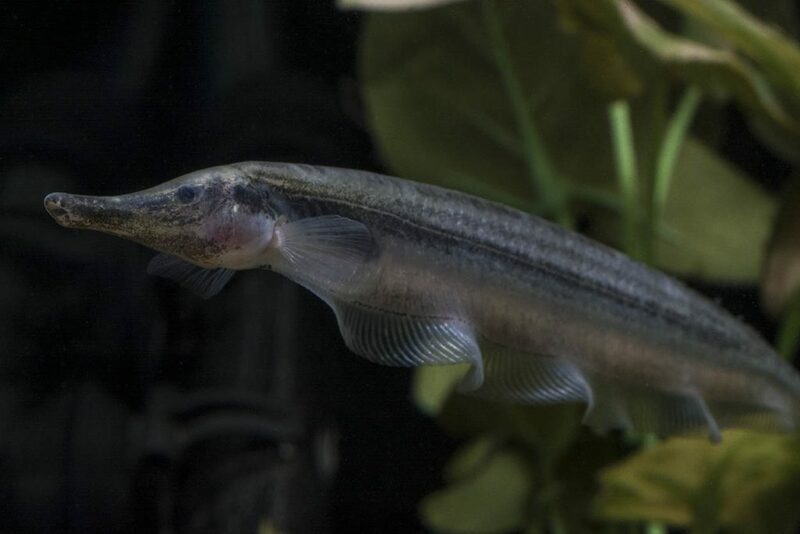 Like all knifefishes, it has the ability to generate a mild electrical current. I’ve always been a sucker for the true oddballs of the aquarium fish world—the cryptic, colorless, weird-looking fish with few, if any, redeeming characteristics. If they’re known to be somewhat challenging to keep and likely to hide all the time, so much the better. 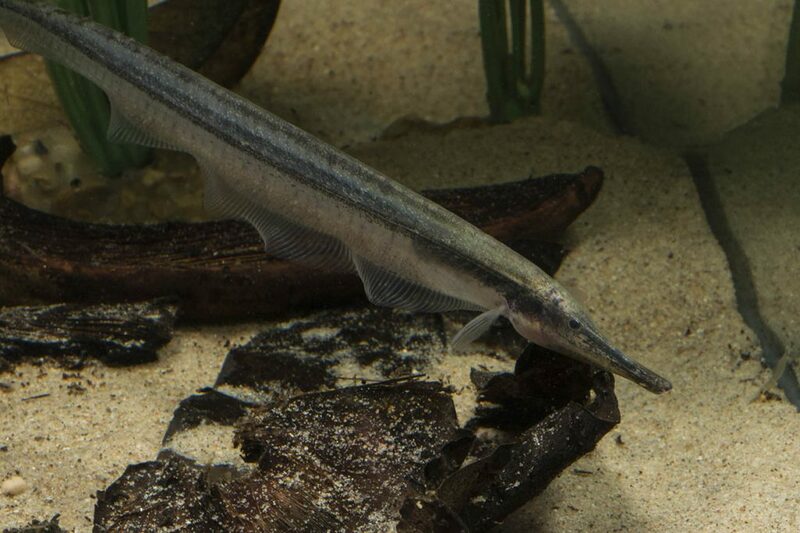 Most of the South American Knifefish–especially the lesser-known species–fit this description well, and therefore have always been a group of fish I particularly gravitate towards. One of these undeniably odd, mostly colorless, and extremely cryptic species is the Thermometer Knife (Gymnorhamphichthys rondoni), which is found throughout the Amazon Basin (although its distribution remains a bit unclear). 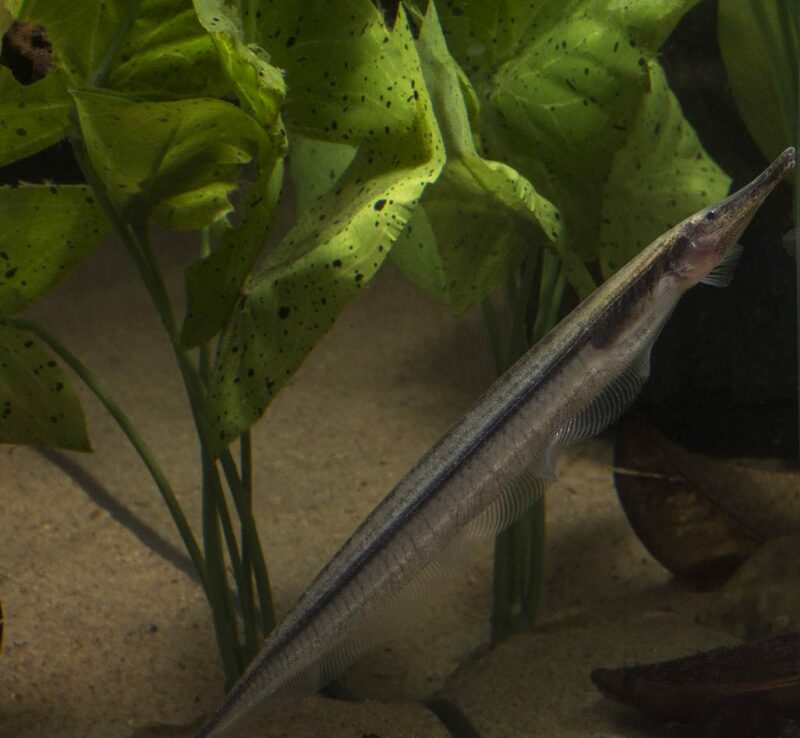 This slender, elongated knifefish is actually a highly adapted substrate dweller that spends most of its time burrowing through the fine sand of its native habitat. 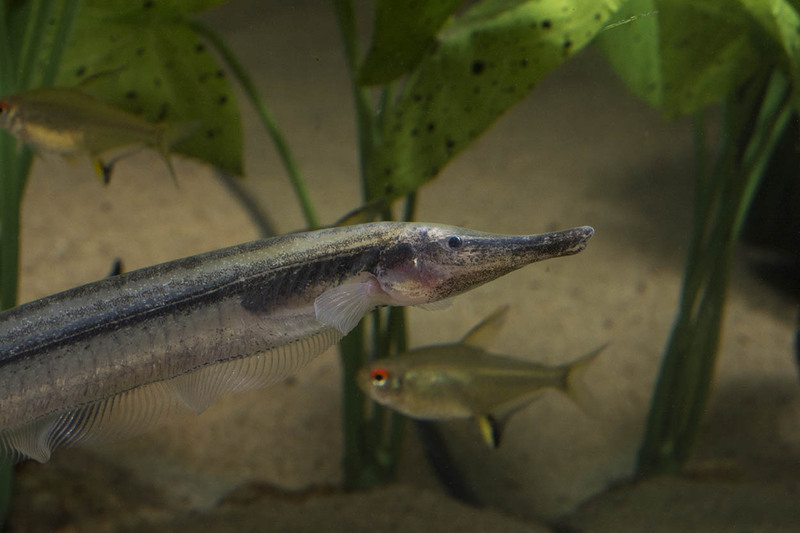 Like all knifefish, G. rondoni is considered a weakly electric fish, using a specialized organ to generate a mild electrical current. This current is used both to communicate with other knifefish and to sense its surroundings. Some sources give it the common names of Mousetail or Elephantnose Knifefish. The fishes’ translucent body, which show most of their inner anatomy—ribs, stomach, nerves and all—is how they get their somewhat unusual name (supposedly, the parallel dark ribs and reddish nerve bundle resemble the mercury and graduated markings of a mercury thermometer). 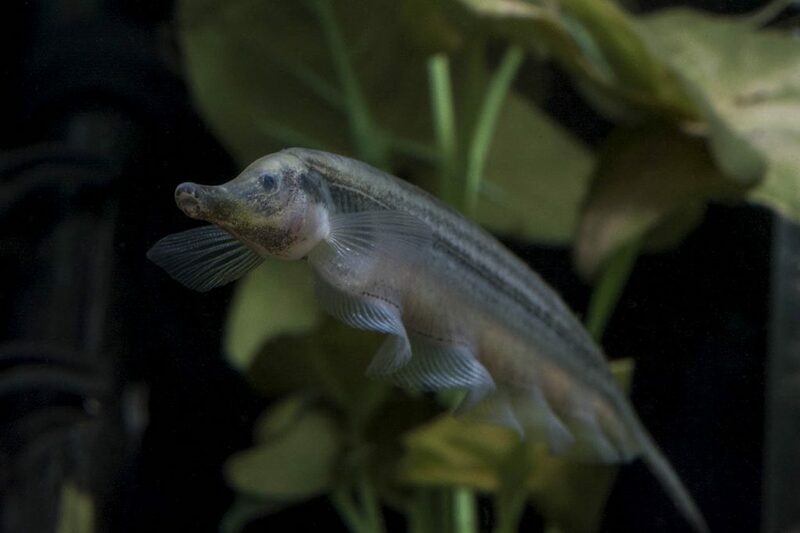 Older specimens lose some of this distinctive pattern, which is more exaggerated in some specimens, but with their prominent snout, and tiny, almost vestigial eyes, they are still unmistakably odd fish. In the aquarium, they are quite cryptic, and tend to spend much of the day fully or partially buried in the sand. As the lights dim, they will emerge from hiding and forage through the aquarium, using their snouts to root through the sand for food. In the wild, this usually consists of worms and insect larvae, but they readily accept frozen bloodworms and tubifex in captivity (make sure to feed them after you turn the lights out, or else their tankmates will easily out-compete them for food). In the trade, the Thermometer Knife tends to be exported from either Eastern Brazil or Iquitos, Peru. I’ve encountered them in the clear waters of the lower Tapajos near Santarem, and it is entirely possible that they are much more common than currently thought due to their sand-dwelling nature. I would go a step further and predict that should the genus Gymnorhamphichthys receive some closer scientific scrutiny in the near future, it may well turn out that what we have been calling G. rondoni represents several closely related species instead, so I will close with a cautionary remark that the fish photographed (which was, to my knowledge, exported out of Iquitos, Peru) might best be referred to as G. cf rondoni. 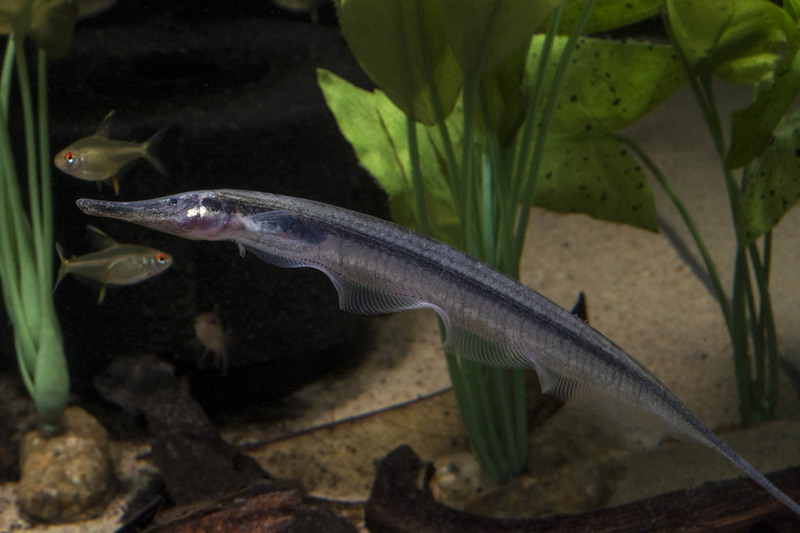 Although cryptic, the Thermometer Knifefish makes for a fascinating, if highly specialized, aquarium resident, growing to about 6 inches (15 cm). Zuanon, J., Bockmann, F. A., & Sazima, I. (2006). A remarkable sand-dwelling fish assemblage from central Amazonia, with comments on the evolution of psammophily in South American freshwater fishes. Neotropical Ichthyology, 4(1), 107-118. 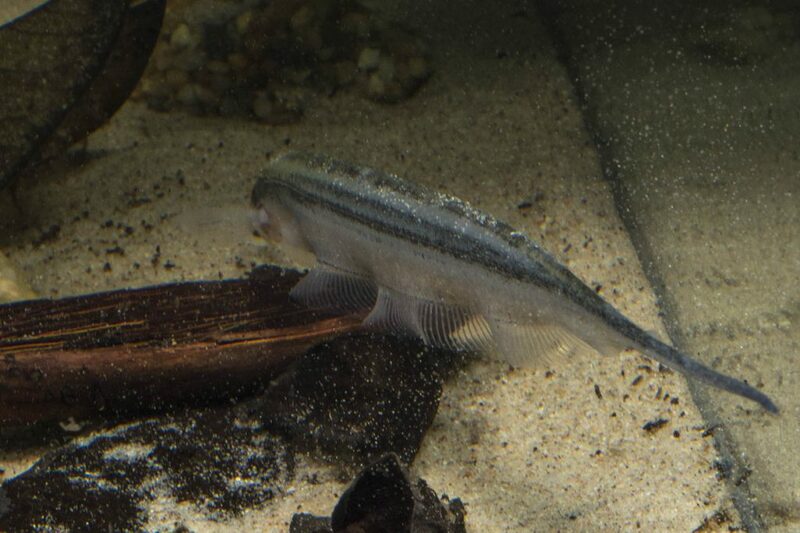 Is this fish safe with small tetras and pencilfish? What is the minimum tank size you recommend?